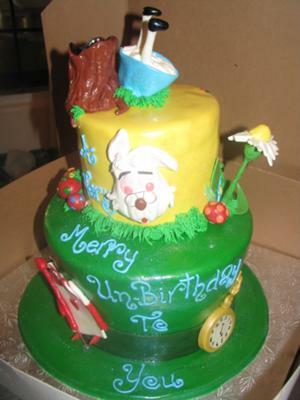 The bottom cake of this Alice in Wonderland cake is chocolate chocolate chip with buttercream filling, carved in the shape of the hat. The top tier is carrot with orange cream cheese filling. Both tiers covered in marshmallow fondant. All decorations are also marshmallow fondant. Everything except rabbit's glasses is edible.